Name : not yet published - can be found under the name : Pinguicula 'Puerto de Gallo', Pinguicula 'Puerto del Gallo' The last one is correctly labelled. The weather of this region is considerably influenced by the diversity of its topography. The general climate changes with increasing elevation : hot and dry in the lowland interior, warm to temperate at medium altitudes and rather humid to cool on the highest peaks. Generally there is a dry season during winter and spring, with precipitation mostly in summer and autumn. Higher in the mountains, precipitation may be over 1600 mm and temperatures become cooler, but the region includes many different restricted habitats. As the farmers are using the forest to shade their coffee plantations they selectively cut mainly Pinus, Quercus and Ficus species. With the increasing population, the road from Puerto del Gallo will be probably improved into a principal highway across the region and the railroad will be extended across to the coast. However, the greatest threat to the region is deforestation due to commercial logging of coniferous and hardwood trees for lumber and paper industries, without reforestation. Many endemic species of flora and fauna are threatened by deforestation. Mexico, from Puerto del Gallo, in the state of Guerrero. topography is generally mountainous, with 40% above 2000 m. The minimum elevation in the north-east is 600 m, in the north-west 2000 m. There are important peaks ("cerros") including Yextla (2950 m) centrally, and in the south-west Teotepec (3550 m) near Puerto del Gallo, Jilguero (2850-2900 m) and Tlacotepec (3330 m). Minimum elevations in the south-west and south-east are 800 m and 1600 m.
Pine-oak forest (2000-2400 m or more) comprising mainly Quercus uxoris, Q. laurina, Q. acutifolia, Q. glaucescens and Q. crassipes with Pinus devoniana (P. michoacana), P. teocote and P. leiophylla,. Pine forest (above 2400 m) in less humid locales, with Pinus herrerae, P. leiophylla, P. ayacahuite and P. pseudostrobus var. oaxacana. The pine forest in some lower and warmer areas (not along this transect) is an association of just P. ocarpa and P. pringlei. In more humid areas, an exuberant mesophyllous mountain forest with several strata and abundant climbers and epiphytes. Characteristic trees, 30 m tall or more include Chiranthodendron pentadactylon, Chaetoptelea mexicana, Abies guatemalensis and Pinus ayacahuite. Shorter trees are Ostrya virginiana, Clethra mexicana, Styrax ramirezii, S. argenteus, Tilia occidentalis, Saurauia serrata, Viburnum ciliatum and Meliosma dentata. Fir forest (2500-3000 m), with individuals of Abies religiosa and A. hickelii up to 30 m tall. On the highest cerro Teotepec there is also a low forest of stout Pinus hartwegii; in rocky places grow Juniperus monticola var. monticola and rosette and cushion species of the páramo. Descending the Pacific slope (below c. 2450 m) is a mesophyllous montane forest with a shrubby stratum rich in Melastomataceae, and many epiphytes - orchids, Peperomia and ferns. Characteristic trees include Podocarpus matudae, Pinus chiapensis, P. maximinoi, Chaetoptelea mexicana, Saurauia angustifolia, Hedyosmum mexicanum, Oreopanax obtusifolius, Dendropanax arboreus, Persea schiedeana, Drimys granadensis, Sloanea medusula and Magnolia schiedeana. I don't know the vegetation associated with this Pinguicula. Any information is welcome. Click on the logo to visit their website with a lot of subjects. My plant was obtained from the collection of Loyd Wix (GB). Multiplication : By seeds ? but I had no flowers yet. The plants can be propagated easily using non-carnivorous leaves separated from the rosette at the end of winter. You only have to carefully tear out the totality of the leaf particularly with it's white base as the new plantlets will sprout from this area. Don't try with the summer leaves, it is harder. Pinguicula zecheri comes from Puerto del Gallo area too. 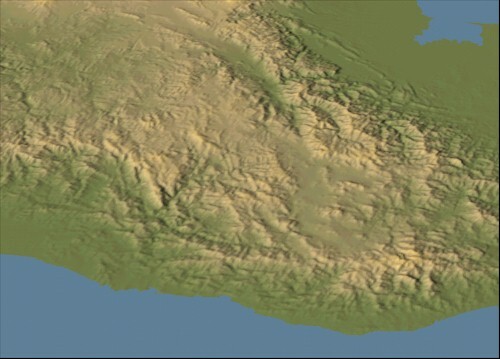 Here is a relief map of the Sierra Madre del Sur (if you still have any doubt for the mountainous status of Mexico). In Guerrero, there are important peaks ("cerros") including Yextla (2950 m) centrally, and in the south-west Teotepec (3550 m) near Puerto del Gallo, Jilguero (2850-2900 m) and Tlacotepec (3330 m). The minimum elevations in the south-west and south-east are 800 m and 1600 m.
Landscape in the Sierra Madre del Sur.